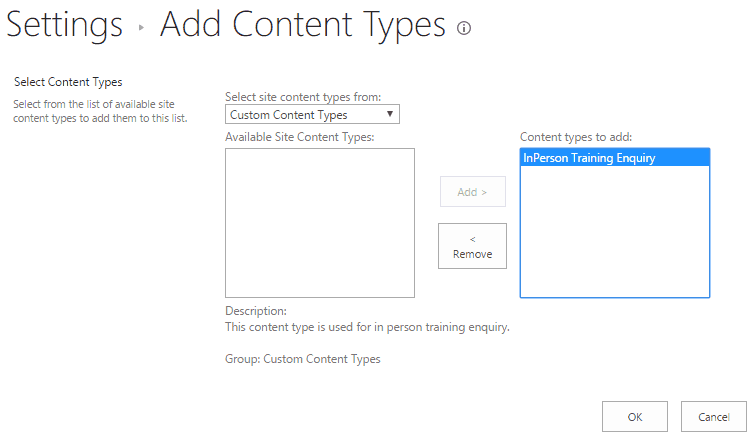 This SharePoint 2016 tutorial explains what is content type in SharePoint? How can we see what are the default content types in SharePoint 2016/2013 or SharePoint online? How to create a content type in SharePoint 2016/2013? A content type is an entity that uses site columns to define a schema of fields for an item in a list or a document in a document library. The content types are defined outside the scope of any list or document library. A content type defines a field collection that is reusable across multiple lists or multiple document libraries. You can update a content type to make the changes available in all list and libraries. A content type represents a group of informational items in your organization that share common properties. Properties may be like name, description, a grouping category etc. SharePoint supports storing multiple content types in one document library. But only one content type can be applied to a particular item in a document library or list. Each content type has a distinctive set of properties and metadata that describe the content. This can include fields that are associated with the content type that can be displayed as columns in the list or document library. It can also include a specific document template used when creating instances of the content type. Or we can access it from the Site Settings page -> then click on Site content types which is under Web Designer Galleries. Also, you can see how we can retrieve all content types using PowerShell in SharePoint 2013. When you add a content type to the content types gallery of a specific site, that content type is available for use within the current site, as well as in all the child sites in the site hierarchy below it. When you add a content type to the content types gallery of a top-level site, it is available for use throughout the entire site collection. SharePoint automatically adds a standard set of content types to the content types gallery of every top-level site. How to publish InfoPath forms as a content type in SharePoint 2013? Every content type that you can create or use inherits from another content type. SharePoint provides a special hidden content type named System, which exists at the very top of the inheritance hierarchy above Item. But as a developer we never interact directly with System content type, so Item content type considered as parent content type of other content types in SharePoint. Each content type has a string-based ID that begins with the ID of its parent content type. Let us say u create a content type based in Item content type then the content type ID will begin with 0x01. The Document content type, which inherits from Item, has an ID of 0x0101. Content types that inherit from Document have IDs that begin with 0x0101 such as Form which has an ID of 0x010101. When you will create a new content type, the content type id will be in below format. Base Content Type ID +00+a new GUID. Then give a name and description for the content type. Then choose a parent content type. Here we have chosen List Content Type and then choose Parent Content Type as Item. This is the content type settings page. You can add existing site columns or you can create new columns also. Click on Add from site column to create a new site column for our content type. Since we have made the content type we can add it to our list. Open the SharePoint 2016 list in the browser. Then from LIST tab click List Settings. Then in the list settings page click on Advanced Settings which is under General Settings. Then in the Content Types select Yes for “Allow management of content types?” and then click on OK.
Then go back to the List Settings page, then go to the Content Types section, click on Add from existing site content types. Then in the Add Content Types page, from the content types group, select Custom Content Types from the drop-down. And then select the InPerson Training Enquiry and click on OK. The content type added successfully. Here we discussed what is SharePoint content types? What are the out of box default content types in SharePoint 2016/2013 or SharePoint online? 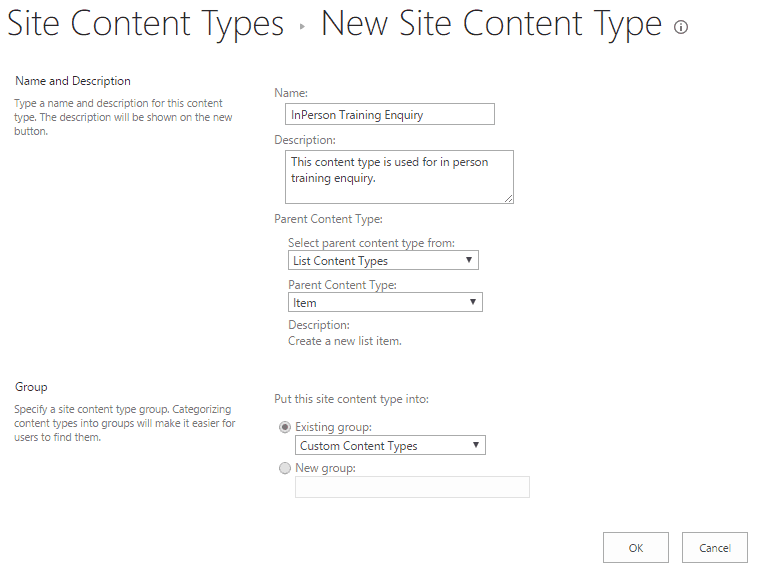 How we can create a content type in SharePoint Online or SharePoint 2016/2013.